Worrisome iPhone users, are you dreading the day when your battery inevitably fails and sticks you with an $85.95 bill after you send it in to Apple to have it replaced? 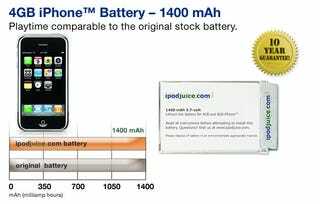 If you're not afraid to try something new, you can start saving a little less each month because ipodjuice.com is hawking a replacement battery for $45 ($65 after shipping). But will you get what you pay for?